It seems about the only thing Ovidia Yu has quit was her quest to become a medical doctor. When she realized it was not what she wanted to do with her life, she turned her attention back to her writing—something she has enjoyed since childhood. 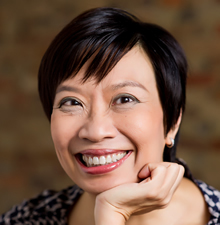 Yu is an award-winning short story writer and playwright with more than 30 plays performed. In addition, she has written novellas, a children’s book (The Mudskipper), and is the author of the entertaining Rosie “Aunty” Lee mystery series whose latest offering is Meddling and Murder. Here a missing domestic worker is assumed to be a runaway in the midst of a series of home invasions and other unusual events. Aunty Lee, as she struggles to understand, continues her meddling ways, putting herself, her restaurant, and her hard-working domestic worker Nina in jeopardy. According to Yu in the same interview, Meddling and Murder has its origins in a newspaper article about a woman who went on a tour of China, met a tour guide who later turned up in Singapore and moved in with her, then started taking over her finances and isolating her from her family. The true crime story allowed Yu to explore other themes, including what it is like to be a foreigner in Singapore, especially if you look like you fit in but don’t and the unconscious assumptions we all make. With the debut of THE FRANGIPANI TREE MYSTERY, the first of the Crown Colony series, Yu takes the reader back to Singapore in the 1930s. Chief Inspector Thomas LeFroy arranges for a local girl, Su Lin, to look after the Acting Governor’s daughter when the girl’s nanny dies suddenly in an apparent accident. 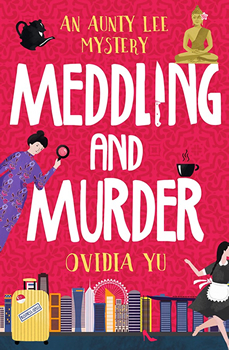 The deaths do not stop there and all of Su Lin’s traditional skills and LeFroy’s experience are needed to solve the murders before she becomes the next victim. 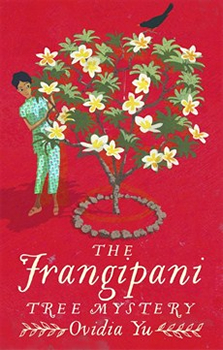 The Frangipani Tree Mystery came about as Yu was looking into the history of her old school. Originally she based the story on the founder of her school, Miss Sophia Blackmore, and Singapore’s Chief Inspector at the time, Rene Onraet. But her editor pointed out the pitfalls of writing about real people, not the least of which are their families. So armed with real world anchors in a fictional past, Yu draws upon the memories she uncovered, ranging from relatives to complete strangers. She supplemented flavoring time and place through collections of letters, photographs, and reading books on the era as well as newspapers of the day. She extended her research to areas surrounding Singapore since the city-state is affected by happenings around it. While the Aunty Lee books, including Meddling and Murder, take the readers into various neighborhoods and households of present-day Singapore, THE FRANGIPANI TREE MYSTERY takes readers back to the days of the British Empire and its influences on its colonies. Both timelines provide details into the everyday lives of the citizens of Singapore. Yu uses Rosie’s café to add even more cultural touches through the culinary aspects featured in the books as well as the customs concerning medicinal herbs and healing foods. In both books, she uses cultural attributes to make Singapore and her stories come alive. When asked about her creative process, Yu remarked, “I wouldn’t describe my process as being creative. Genre fiction, which I love reading and writing, is like a chess game. The board and the pieces are fixed but you can do anything you want with them. And games are only fun when both sides are closely matched enough to make it a real fight. Seeing it this way helps me to make sure all the pieces on both sides count. For example, pawns are settings, weather, food, news events; rooks are faithful companions; knights can be a love interested or rich relatives or that computer-hacking genius friend…it all plays into the movement of the story. And if you end up in a draw so be it. But each side has to chip away at the other side and create patterns to lure them into defeat or draw. And the beauty and art and ‘creativity’ is in how you play the game. Yu is currently working on editing and rewriting the next installment in the Crown Colony series, The Betel Red Mystery and has plans for the third, The Hibiscus Blossoms Mystery, underway. Aunty Lee fans don’t despair, Yu is working on the first draft of the next adventure tentatively titled, Fishy Business. Ovidia Yu was born in, lives in and writes about Singapore. After a happy childhood spent reading, drawing comics and dramatizing stories, she dropped out of medical school because while medicine is fascinating, she didn’t want to be a doctor. Fortunately, relatives who now spend family reunions claiming/denying Aunty Lee’s habits and quirks, have forgiven her. One of Singapore’s most prolific playwrights, Ovidia has had over 30 plays produced. The Frangipani Tree Mystery is the first book in her Crown Colony Series. To learn more about Ovidia Yu, Aunty Lee, The Crown Colony mysteries and more, please visit her website.